In an article posted at 4:39pm, December 16th, drf.com reported that a tentative deal has been struck to keep Monmouth Park open in 2012. Proposed is a longer meet and purses that will be funded only by money produced from wagering. That will mean substantially lower purses, until a new private lease holder is found. Read the rest of the drf.com article. Discuss the issues at HorseRacingNation.com. 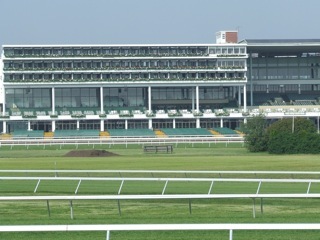 Monmouth Park in New Jersey will hold a 141-day meet in 2012 while the state reopens the bidding for a long-term lease of the track under a deal that was discussed on Friday between the state’s horsemen and the office of Gov. Chris Christie, officials of the horsemen’s organization said. The horsemen’s representatives said that the deal was substantially complete late on Friday, though final approvals of the agreement were still not in place. Christie has set a Monday deadline for the horsemen and the state to agree on a deal for the 2012 meet, threatening that he would close the track if an agreement had not been reached. Under the deal, horsemen at Monmouth will run for “generated purses” in 2012, meaning purse distribution will be determined solely by the revenue raised from betting. As a result, overnight purses at Monmouth over 141 days this year will likely average approximately $150,000 to $175,000 a day, a sharp decline from average overnight purses this year of approximately $400,000 during a 71-day meet. This entry was posted in Horse Racing Nation, Monmouth Park, Uncategorized. Bookmark the permalink.